When the UT women’s golf team looks back on its 2013-14 campaign, it will see a year that was filled with numerous records and honors. 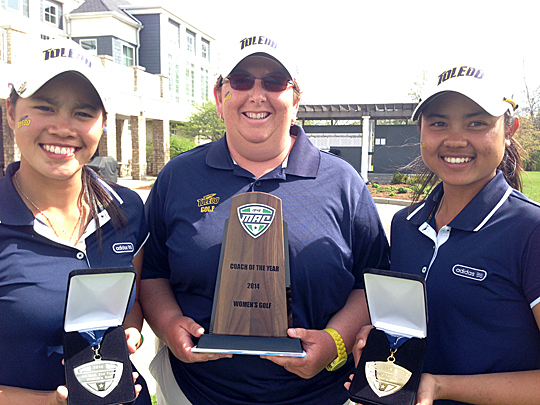 Manisa Isavas, Head Women’s Golf Coach Nicole Hollingsworth and Sathika Ruenreong showed off their honors after the MAC Championship Tournament. All of the Rockets’ hard work was recognized following Sunday’s final round of the 2014 Mid-American Conference Championship when Head Coach Nicole Hollingsworth was honored as the MAC Coach of the Year, marking the first time in program history a UT coach has received the award. Two Rockets also were honored: Sophomores Sathika Ruenreong and Manisa Isavas were named to the conference first- and second-teams, respectively. The Rockets’ first two-time first-team All-MAC honoree, Ruenreong shattered UT’s school record with a 74.5 stroke average, over one stroke better than the previous mark held by Tammy Clelland (75.7 in 2005-06). A 1995 Indiana University graduate, Hollingsworth guided the Rockets to a school-record 302.1 scoring mark, more than four strokes in front of the 2005-06 squad’s 306.2 figure. Toledo also tied its school record with four tournament titles and registered its second-straight second-place showing at the MAC Championship. This entry was posted on Tuesday, April 29th, 2014 at 3:43 am and is filed under Athletics, News .